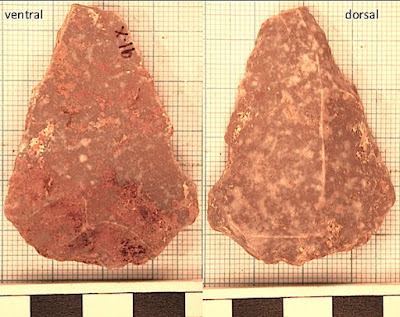 Two stone tool points made using a prismatic blade technique (left and center), and a bone point or needle (right). The finds "give us a new window onto a transitional time, on the cusp of modern human cultural behaviors," says anthropologist Aaron Stutz. 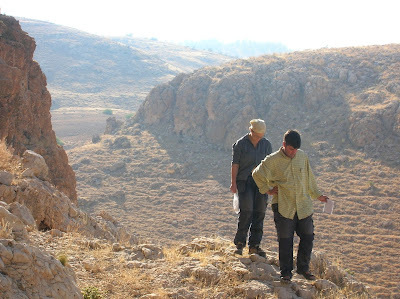 Liv Nilsson Stutz and Aaron Stutz in the field, on the terrace of Mughr el-Hamamah. One of the tools made with the Levallois technique, used by Neanderthals and anatomically modern humans alike in earlier periods. 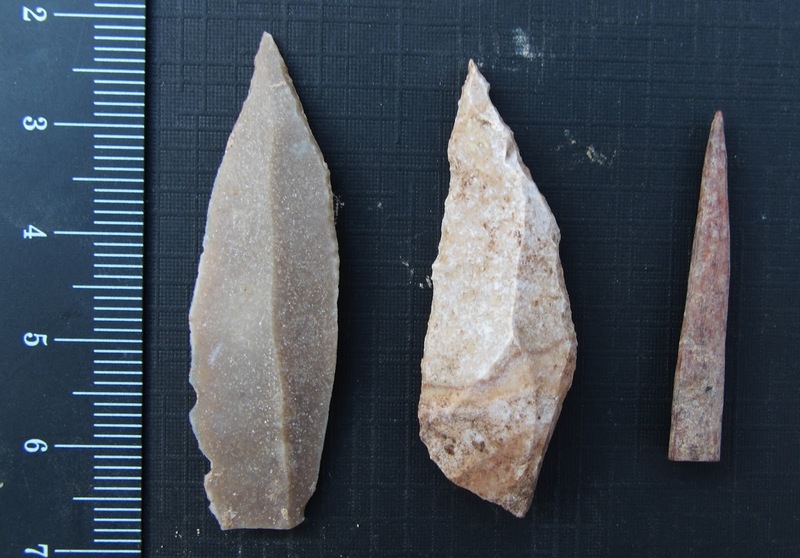 Artifacts from the cave also included scraping tools, made on thick blades for hafting onto a handle and likely used for working wood and animal hides. Other tools continued to be crafted with what is known as the Levallois technique, which was more often used to make the multi-use flakes and triangular points so common in earlier periods. Additional co-authors of the study are: Jason Rech of the University of Miami; Miriam Belmaker of the University of Tulsa; Rosa Maria Alert and Dan Cabanes of the University of Barcelona; Trina Arpin, an independent researcher in Boston; Jaime Clark of the University of Alaska, Fairbanks; Gideon Hartman of the University of Connecticut; Fuad Hourani of the University of Jordan and Chantel White of the University of Notre Dame. Credits: Tool photos by Aaron Stutz; field photo by Julie Margolis.